I have to admit, this was the first time I ever made homemade pancakes. I will also admit, I will never make them any other way again. These were the best tasting pancakes I ever had. The family loved them a lot. They are just as easy as a batter mix so there is no reason not to make them this way. I hope you will try them too. In a large bowl, mix together the flour, baking powder, salt and sugar. Make a well in the center and pour in the milk, egg and melted butter; mix until smooth. Heat a lightly oiled griddle or frying pan over medium high heat. 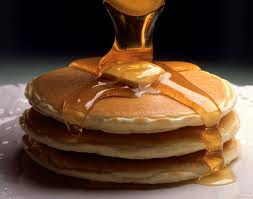 Pour or scoop the batter onto the griddle, using approximately 1/4 cup for each pancake. Brown on both sides and serve hot.